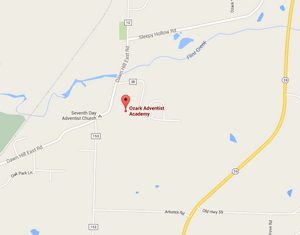 Ozark Adventist Academy is located in Northwest Arkansas between the towns of Siloam Springs and Gentry. We are only 20 minutes away from Northwest Arkansas Regional Airport (XNA). From U.S. 412, take Arkansas 59 north approximately 3.5 miles. 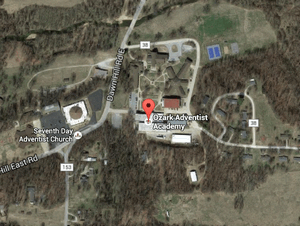 Follow the [Ozark Adventist Academy] signs by turning left on Arkotex Road, then turn right on Cozy Corners Road, then right again on Dawn Hill East Road. The entrance is on the right just before Flint Creek.